Mix the curds with 1 1/2 cups of water. Combine the besan, curds-water mixture, lemon juice, ginger-green chilli paste, turmeric powder, asafoetida and salt in a deep non-stick pan and mix well to make a smooth batter (taking care that no lump remains). Cook on a slow flame, while stirring continuously till it becomes thick (approx. 8 to 10 minutes). Grease a thali on the reverse side using 1/4 tsp of oil and spread a spoonful of the batter on a greased thali and wait for a few seconds and try to roll up. If it doesn't, then cook for a few more minutes, and check once more till done. Divide the batter into two equal portions. While the batter is still hot, spread each portion evenly using a spatula, on the reverse greased side of 2 thalis evenly to make a thin uniform layer using a spatula (refer step 1). 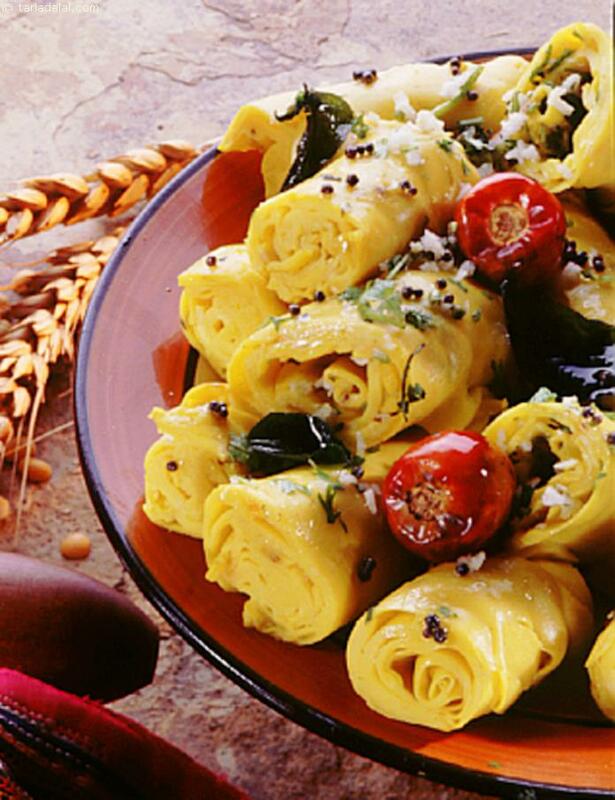 When cool, cut the khandvi on each thali lengthwise into equal portions (as shown in the image) and roll up each gently (refer to step 2 and 3). For the tempering, just before serving heat the remaining 3 tsp oil in a small non-stick pan and add the mustard seeds. When the seeds crackle, add the asafoetida, curry leaves and green chillies and sauteon a medium flame for a few seconds.